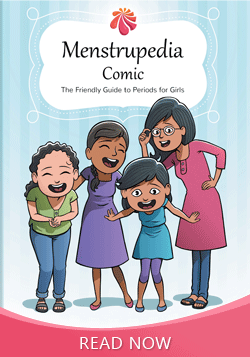 A girl may experience her first period between the ages of 9 to 14. The exact age at which this happens is variable and differs from one person to another. A sexually mature girl menstruates once in every 29 to 31 days. During pregnancy the uterine lining is utilized to nourish the baby in the uterus and hence menstruation does not happen. It starts again after the baby is born. Menstruation ceases between the ages of 40 to 50 varying on an individual basis. This marks the end of the fertile phase of a woman's life and is known as menopause.